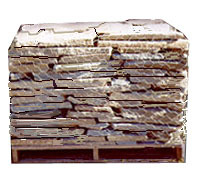 1" to 3" stones of mixed various size with flat smooth face Great for walls, paths, facing and a variety of other projects. This product is actually snapped bluestone and flagstone direct from our quarry. available in the many colors grey, grey-blue, grey -green and red. Special orders taken. Johnson & Sons Stone Works Inc.